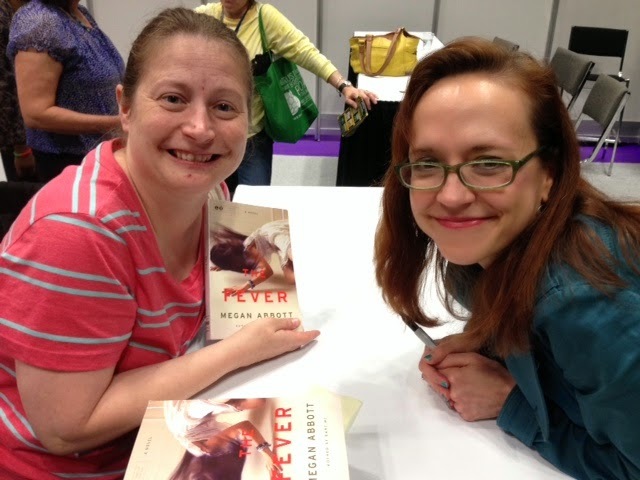 This is one I was lucky enough to get an ARC of at BEA this summer, along with an autograph. It was one I wanted for sure, the little synopsis sounded good. But I guess I only read the first sentence or two of that, because I didn't realize that it was about the same incident that a book I finished reading a little while ago, Conversion, talked about. Again, I remember the story of the girls who were all of a sudden coming down with tics and other ailments for seemingly no reason, out of nowhere. While Conversion kind of went with a tie to the Salem witch trials, this book was different. The main character is really Deenie. All of the problems begin when her friend Lise collapses in the middle of class and begins having a seizure. Unfortunately in this day and age of the cell phone, other students take pictures of her in this situation, and many aren't flattering. She goes home, has another seizure, which leads to a cardiac event of some sort, and she falls and hits her head on a coffee table. She is taken back to the hospital, where soon she is just unconscious, basically in a coma. Her mother begins trying to figure out what is the cause. And not long after this, Deenie's other best friend, Gabby, also seems to have a seizure, at school, in the middle of an orchestra concert. Hers doesn't seem to be quite as bad. But now all the parents are up in arms, trying to figure out what is going on. One thing that is jumped on is the HPV vaccine that the school had begun making all girls get, or getting a note to get out of it. But then another girl gets sick, and it turns out that she didn't have the vaccination. So talk in the town turns to the really gross polluted lake nearby. And of course there is even some talk about girls getting sexually active too soon. Which the girls do talk about in this book. We also get part of the story from Deenie's father, Tom's point of view. He is a teacher at the school, so it is definitely good to get both a parent, as well as a staff member at the school's take on what is happening. As a science teacher, he is able to be rational about what the cause might be even. We also get some bits from the point of view of Deenie's brother Eli. Eli seems to be a bit of a womanizer. And I don't know that I really am a huge fan of his from how the book portrays him. I can't quite figure out what is going on with him. I think that the author is trying to show how confusing it might be for a boy that age to have girls throwing themselves at him, all the time thinking about how he would feel if his sister did those things, and if boys treated her the way he treated some girls so casually. Definitely a different take than Conversion, and the story is told in a way I got to know the characters better than I felt I did in Conversion. But both have their own good parts. So I think it could be something to have students read both books and compare, then look at maybe newspaper articles of the actual events these are kind of based on. 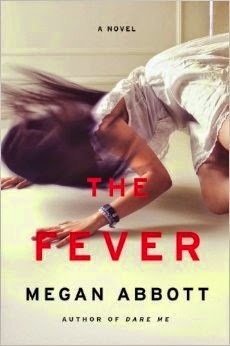 I have arcs for both books, and actually read The Fever first. I tried to pick of Conversion about a week later, and found it just couldn't hold my interest since the two really are so similar. I have to say that I was really disappointed with this book. I was so intrigued by what was going on *SPOILERS* and then was so disappointed by the complete lack of answers concerning all the other girls. It just felt cheap to me and I felt rip-offed by the ending. I did like the multiple perspectives, though. Great review! I definitely agree that I kind of need to know what happened with the other girls. But, I feel like with Conversion, and the true story of this, there wasn't ever anything that said for sure, they never found an answer. Thanks for visiting! Sounds like something that happened over here a little while ago. A bunch of girls at a high school suddenly started screaming and complaining about being unable to move. The hysteria spread quickly and something like a dozen girls were affected. They had to close the whole school for a while. Creepy. This was based on a true story from a few years ago I think. Wonder if it is from by you? Interesting!